Time series of selected images of 17P/Holmes taken with an RC filter. All images have the standard orientation, that is, north is up and east to the left. At the bottom right in each image, solid vectors denote the orientation of the negative velocity of the comet, and dashed vectors show radial vectors outward from the solar direction. Credit: Yuna Grace Kwon et al., 2014. (Phys.org)—Periodic comet 17P/Holmes is usually a very faint object. However, during its historic outburst in October 2007, when the comet's coma expanded to a diameter greater than that of the sun, it became visible to the naked eye and was temporarily the largest object in our solar system. This event has drawn the attention of astronomers worldwide trying to investigate the comet's uncertain and changing nature. 17P/Holmes has been intensively monitored during its perihelion passage in 2014 and the results of these observations were detailed in a paper published Dec. 29, 2014 on the arXiv pre-print server. 17P/Holmes is a Jupiter-family comet discovered by Edwin Holmes in 1892. Although the comet's massive outburst event in 2007 was well-observed, very little is known about the long-term evolution in the activity of 17P/Holmes. The perihelion passage seven years later was expected to be a great occasion to study the comet in detail. Unfortunately, in March 2014, it passed its perihelion so far that there have been no published reports about the physical state of the comet during this passage. 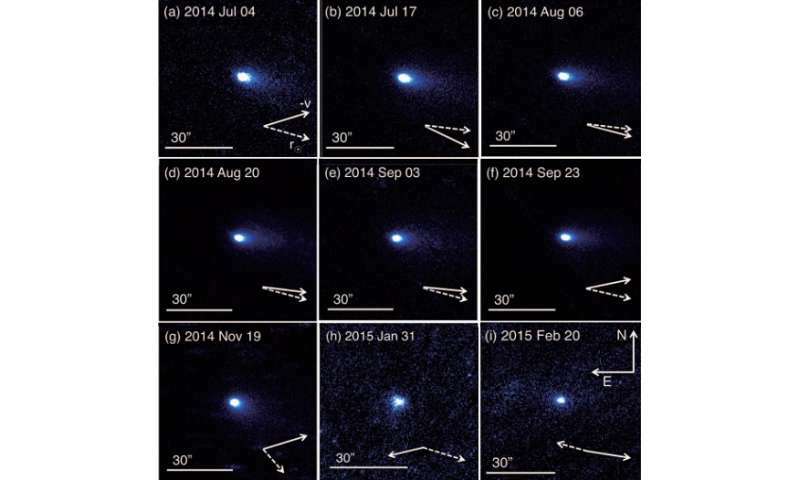 Now, a research team led by Yuna Grace Kwon of the Seoul National University in South Korea, reports its photometric monitoring observations of the comet over a period of nearly two years from May 2013 to March 2015, including the 2014 perihelion passage. To monitor the comet's activity, six ground-based telescopes were employed at five observatories: the Ishigakijima Astronomical Observatory (IAO), the Okayama Astrophysical Observatory (OAO), the Nishi-Harima Astronomical Observatory (NHAO), the Siding Spring Observatory (SSO), and the Bohyunsan Optical Astronomy Observatory (BOAO). Thanks to these observations, the researchers were able to detect the comet's circumnuclear dust coma and its feeble dust tail. They found out that the dust mass loss rate of 17P/Holmes' inner dust coma has been declining with increasing heliocentric distance. They also noticed that the dust production rate became equivalent to the level before the 2007 outburst. "The dust production rates around the 2014 perihelion passage were about five orders of magnitudes lower than the maximum value during the 2007 outburst, while they were comparable to that of the pre-outburst data," the researchers wrote in the paper. According to research team, this similarity suggests that the comet's activity was restored to its former state, although it has shown lingering activity for years when it was around its aphelion. They noted that the mass loss process yields valuable information for monitoring the activity of the 17P/Holmes. Besides determining dust production rates, the scientists also calculated the diurnal skin depth and growth timescale of the comet's dust mantle, inferring that it is now nearly five to seven centimeters thick and has been developing apace over the last seven years. "17P/Holmes spends more than half a revolution period beyond the heliocentric distance of three astronomical units. Taking into account the persistent activities of the comet around its aphelion it should have had favorable conditions in developing the dust mantle with continuously outward sublimating volatiles over quite large portions of its orbit," the paper reads. The researchers assume that the activity of 17P/Holmes is highly controlled by the formation and evolution of dust mantle. By monitoring the evolution of the fractional active area over the cometary surface, they concluded that the overall activity of 17P/Holmes has been significantly restrained during the 2014–2015 outbound orbits. The new results might also indicate that inactive or dormant comets are aided by the development of their dust mantles acquired over their evolutionary histories in the inner part of our solar system. We performed a monitoring observation of a Jupiter-Family comet, 17P/Holmes, during its 2014 perihelion passage to investigate its secular change in activity. The comet has drawn the attention of astronomers since its historic outburst in 2007, and this occasion was its first perihelion passage since then. We analyzed the obtained data using aperture photometry package and derived the Afrho parameter, a proxy for the dust production rate. We found that Afrho showed asymmetric properties with respect to the perihelion passage: it increased moderately from 100 cm at the heliocentric distance r_h=2.6-3.1 AU to a maximal value of 185 cm at r_h = 2.2 AU (near the perihelion) during the inbound orbit, while dropping rapidly to 35 cm at r_h = 3.2 AU during the outbound orbit. We applied a model for characterizing dust production rates as a function of r_h and found that the fractional active area of the cometary nucleus had dropped from 20%-40% in 2008-2011 (around the aphelion) to 0.1%-0.3% in 2014-2015 (around the perihelion). This result suggests that a dust mantle would have developed rapidly in only one orbital revolution around the sun. Although a minor eruption was observed on UT 2015 January 26 at r_h = 3.0 AU, the areas excavated by the 2007 outburst would be covered with a layer of dust (<~ 10 cm depth) which would be enough to insulate the subsurface ice and to keep the nucleus in a state of low activity. I love that comet. Those were some great times watching it for months, particularly when it crossed the Milky Way around Perseus. I've taken over 10,000 astrophotos and I'd rate some of those as my all time favorites.